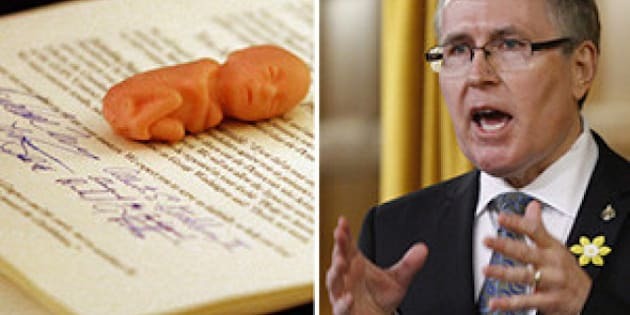 OTTAWA - Conservative MP Stephen Woodworth is out with another motion that could re-ignite the abortion debate in Ottawa, although he says it's merely about respect for human dignity in law. The Ontario backbencher attempted to persuade MPs last year to study whether a fetus is considered a human being before being born. The controversial move reopened the door to a political debate on the abortion issue, despite pronouncements from Prime Minister Stephen Harper against it. Woodworth's original motion was easily defeated, with Harper helping to vote it down. But it was backed by 10 cabinet ministers and nearly half of the Tory caucus. The MP maintains that his efforts are not directly about abortion, and questions why his latest motion would even be considered contentious. "Only in a bizarro-world Canada would my motion be considered controversial," he said. "It shouldn't even need a debate (to pass)." Woodworth added that even the prime minister may have misunderstood the intentions of his fight to change the law. "I would like to believe that . . . there are people who were really hypnotized by the word 'abortion,'" he said, acknowledging the motion would have an uphill battle. "I can't say that I'm highly optimistic that Parliament will adopt this principle. But it is my job as a member of Parliament to be concerned about the legal and legislative system that our country possesses, so I have to bring this forward." Critics say no matter how Woodworth justifies his motions, they are merely a back-door way of reopening debate on an issue that was put to rest years ago. “It’s unfortunate that we’re seeing this double-speak," said New Democrat MP Niki Ashton. Canadian women understand that "you have people like Woodworth pushing an agenda that wants to set us back decades," she said. Canada has not had an abortion law in place since the 1980s.